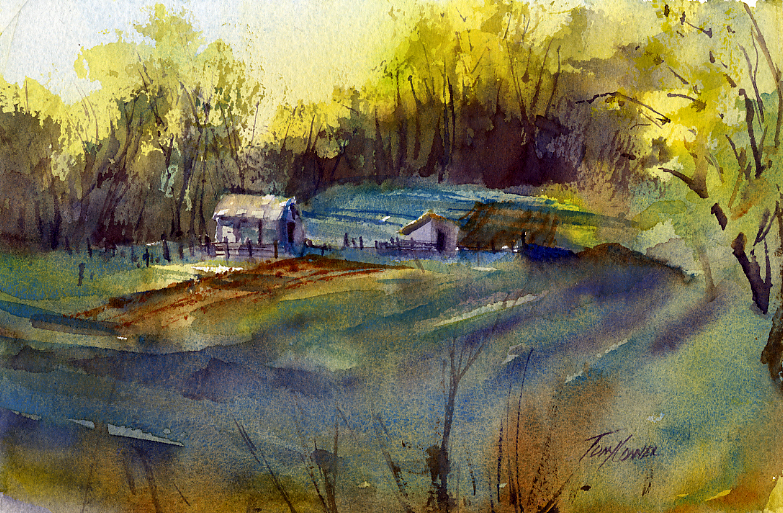 The biggest difference between winter en plein air and any other time, is how early the sun makes it’s presence felt. Although I was out right around 6am, the sun had already started to the tops the tallest trees and even managed to touch down here and there on the ground. The earliest greens of spring are vivid. Even at an early hour, the greens resonate through the blue tinged shadows. Everything in shadow seemed to merge together; only the areas lit by the sun seemed to stand out from the soft landscape. The whole scene had a bit of fantasy about it. Contrasts, both subtle and sharp,are often found in my landscape scenes. This one has both. The sharp color and temperature contrasts in the background tree area help us read bright morning light. The shadowed areas in the middle and foreground have softer and subtler contrasts – the darks are not as dark, the lights not as light.